Engraving of Clement C. Moore by J. W. Evans. Author Clement C. Moore is the author of the favorite seasonal poem A Night Before Christmas, which has become just as beloved as other American folk tales. Upon its publication, however, authorship wasn’t attributed to him. The poem was originally titled A Visit from Saint Nicholas and today, it’s known as Twas The Night Before Christmas. The humorous and magical tale was published in the Troy Sentinel, a newspaper, a few days before Christmas, on December 23, 1823. The Christmas story charmed readers instantly, but Moore didn’t claim ownership until his children urged him to. Do so. He eventually published the verse in a collection of poems in 1844. Today, the world knows him as the author of the verse. He wrote the poem as entertainment for his children, and his adult daughter, Mary, even provided illustrations for an early edition. 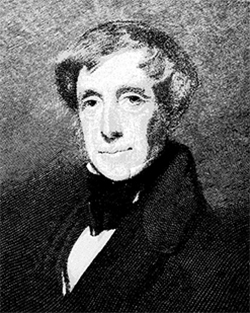 Clement C. Moore was born Clement Clarke Moore in 1779 in New York City. His father was a Bishop, and Clement’s life too would be filled with positions in religious institutions, as well as academia. Moore attended Columbia University (then known as Columbia College) for his B.A and M.A., but he made more of his work in the religious sector. Moore inherited a sizable estate of land, and he donated 66 tracts of it for the Episcopal Diocese of New York to establish the General Theological Seminary. Known for his expertise in ancient languages, Moore served as a Professor of Oriental and Greek Literature, and Divinity and Biblical Learning at the seminary. The seminary still stands on the same spot today. Moore also helped establish a new church, St. Luke in the Fields for the Trinity Church – the same church he would later be buried at upon his death in 1863.